I dropped off the site for ages again, sorry about that all, my life just went rapidly down hill in every shape and form, from having to move home (again), to spending New Years in hospital and breaking up with my other half immediately afterwards. A break from blogging was needed but I apologise for not informing you all. I may not update as often as I'd like at the moment, but I'll try and make the time to do so, I'm still recovering from an awful few months. I've had a major hobby weekend involving an overnight battle against Tyranids (battle report soon, or you can check #artofwarhammerblog on instagram to check out the pictures) and got my next Another Army lined up for posting soon (and it's a good'un! 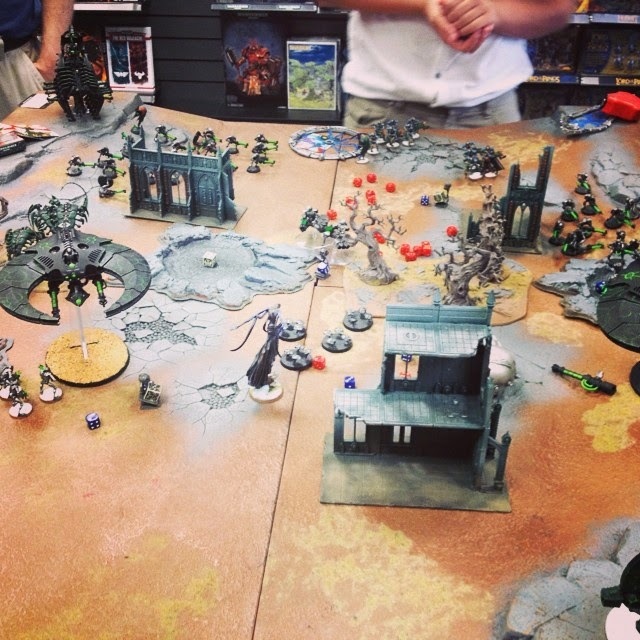 ), but before that I decided to post the "least exciting" update first which focuses on my Necron versus Necron battle at Enfield store last Saturday, ticking another army to face this year off the list! Mayhem ensued whilst Dyansties clash! This battle was a pretty interesting one even if it doesn't sound like it. We played Cloak and Shadow so our tactical objectives were hidden from each other which is a scenario I've always wanted to try out (on a side note, I really don't care for Eternal War anymore, Maelstrom's where it's at for me!). It was interesting to also play 7th with no psychic powers at all and vehicles not really proving to be much stronger against gauss flayers, the game felt similar to 6th edition and was a real battle of who knew their army best. I can tell you all now I won the game with 8 points to 7, but the game was so close we decided to see it as a draw. It was great to see the same army being played in two different ways, both sides had weaknesses and strengths the other side didn't. I was pleasantly surprised by this battle. It really was about beating your own army, what works in some situations, what doesn't but also I got to see what my army lacks and how I can utilise that knowledge in future games. Doomsday Arks have earned some respect from me after the battle, I completely overlooked it's 72" range. 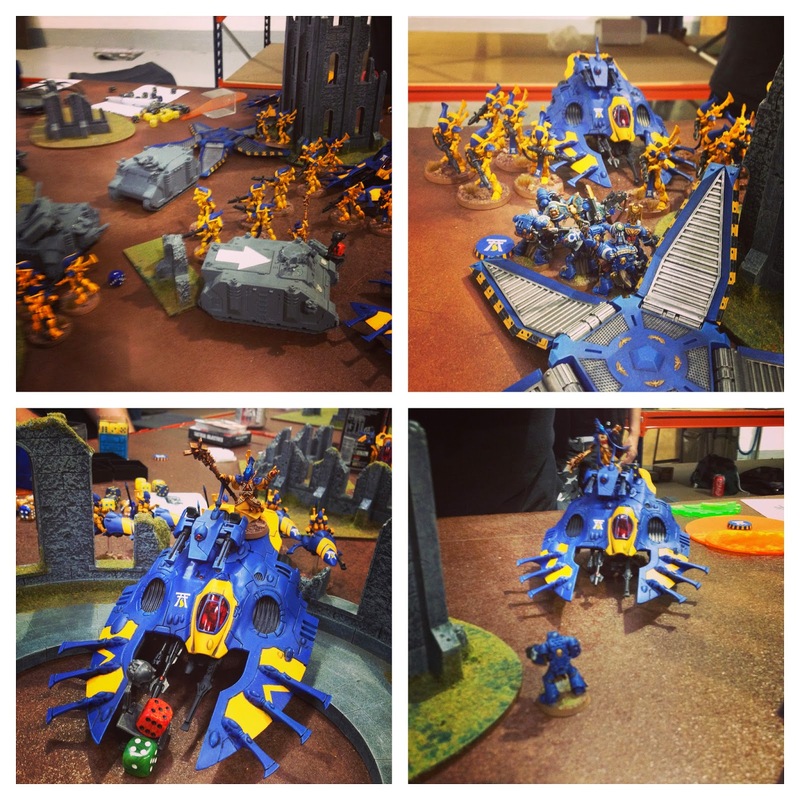 My opponent used it to flatten my squads perched on top of a hill, and I had to take it out with my Wraiths in the end, quickly. It's actually a pretty great alpha strike weapon that forces your opponent to do something about it. Doom Scythes are another thing I underrated and prove to be amazing surgical strike units. My opponent took 2 and a single flyer eradicated both my Triarch Stalker and Annihilation Barge in a single turn, eek! I'd imagine these are great against Astra Militarum, zapping tank squadrons in a single turn. Harbinger of the Storms wins again, this guy is so underrated. His kill tally has been impressive since the day I started using him, and now he can add a Doom Scythe to that tally. Deathmarks really need to stop being deployed in deep strike, they never stay on target for me, going into ongoing reserve twice! NEVER underestimate 20 man Necron Warrior units. Not only do they put out disgusting amounts of fire power, they're also really hard to shift and your opponent will tend to find bigger threats to deal with over them. 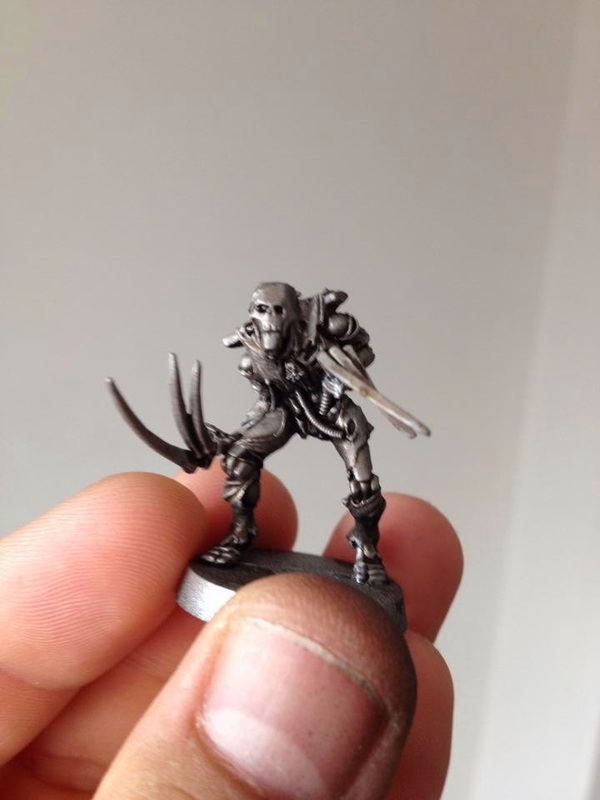 Anyways, there will be more Necron related posting soon, but not from my collection (wink wink). Until next time fans! Check out the Resolution Monitor! 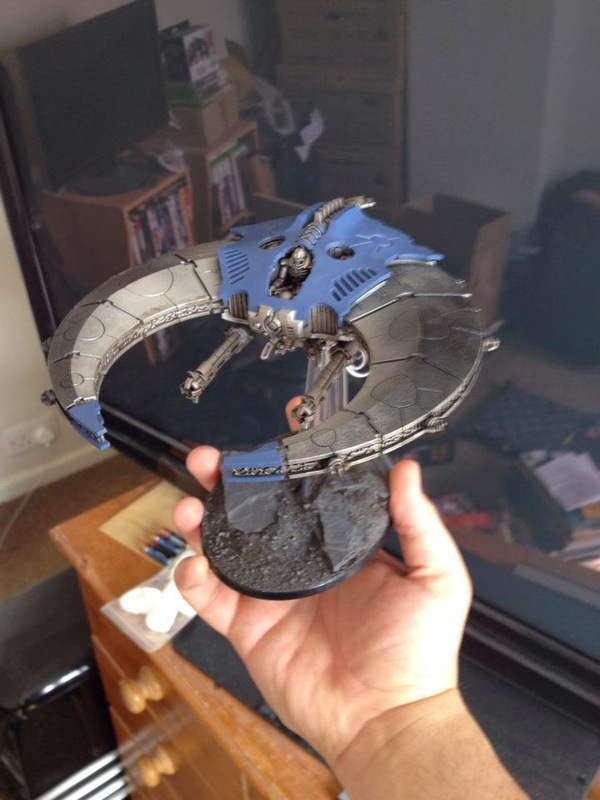 On Saturday I did my regular pilgrimage to Hockley and to Table Top Nation for a couple of games and some shopping, but before that I finished my Sternguard just in the nick of time! So with my freshly painted Sternguard in my case, it was time to blood them. When I was told my first game would be against fellow Imperials, the Blood Angels Chapter, I was well up for bashing some Space Marine skulls. It was also a great opportunity to see not only how differently both armies played, but how similarly as well. The Blood Angels won in the end after a tight battle in which my Ultras held their own for a good while, with mere Ultramarine Tactical Marines doing a sizeable amount of damage in close combat against Blood Angel Assault Marines (we even drew combat at one stage). I deployed a new tactic in infiltrating my Combat Squad'ed Tactical Marines using Sicarius's special rule in order to pin point my deep striking Terminator Squads. With such a weak squad in enemy lines, my opponent mostly ignored them and payed the price as my Terminators smashed 2 Predator Tanks from the flank. My Legion of the Damned also did me proud, absolutely annihilating a 5 man Tactical Squad in close combat, killing another 3 marines in shooting and then killing a further 3 in another close combat phase. I was really stunned by their absolute determination to not die. Sicarius was charged by this Furioso Dreadnought on the second Blood Angel turn and, not only survived until the end of the game, but killed the Furioso one on one before killing an Assault Marine next phase. What a boss! My second game was against a foe I had little hopes of winning against in all honest and, as expected I didn't, but it was a fun game to play even though we decided to call it at the end of turn 5 as I only had 2 Space Marines left on the table whilst confronted by 2 Wave Serpents and a squad of Strength 4 Ap 2 flamer wielding Wraith Guard. No chance for survival! Still, there were some great moments in the game. The combined efforts of a lone Lascannon guy, my Predator and my Sternguard, I took down the Wraith Knight in a couple of turns (my Sternguard taking off 3 wounds in the first turn alone!). My Legion of the Damned did me proud once again as they took out a Wave Serpent in a single combat round. Eldar have disgusting weapons by the way. Brilliant day, 2 brilliant games with 2 brilliant opponents. I tried some interesting tactics, most of which paid off better than expected, so in a nutshell what exactly did I learn? Teleport Homers are really useful if used correctly. My Sargent was vital in positioning my Terminators against the Blood Angels, allowing them to take out their tank contingency. Lascannons are more amazing than I remember. My combat squad with a Lascannon became very useful for either killing tanks or chipping away wounds (especially against the Wraith Knight). Psykers are so useful, even if it's just for dispelling powers in 7th edition. Dead tanks are great for blocking line of sight! All in all, I have a few lessons to take away with me and some more combinations to try out in future. A second Lascannon squad or Stormtalon prehaps, or bigger Legion of the Damned/Sternguard units. Tigurius and Sicarius will most definitely be staying in most of my lists but I am itching to try some new HQ combinations out as well. 7th edition plays really well, much better than I expected. Psychic powers flow nicely, tanks are about right in their toughness now and just a lot of kinks have been ironed out. Also I forgot to mention both games I played were Maelstroms of War, and they were so much fun to play that I may never even consider Eternal War missions now. Most importantly of all, I can tick some resolutions off my list! Until next time folks! A day late and only one post for the entirety of June. I'm slipping! Truth be told been very busy and had little time to paint, let alone post. I've been trying to get my Ultras going but didn't get as far as I wanted, but as you can see the eternally almost finished Sternguard are almost finished! 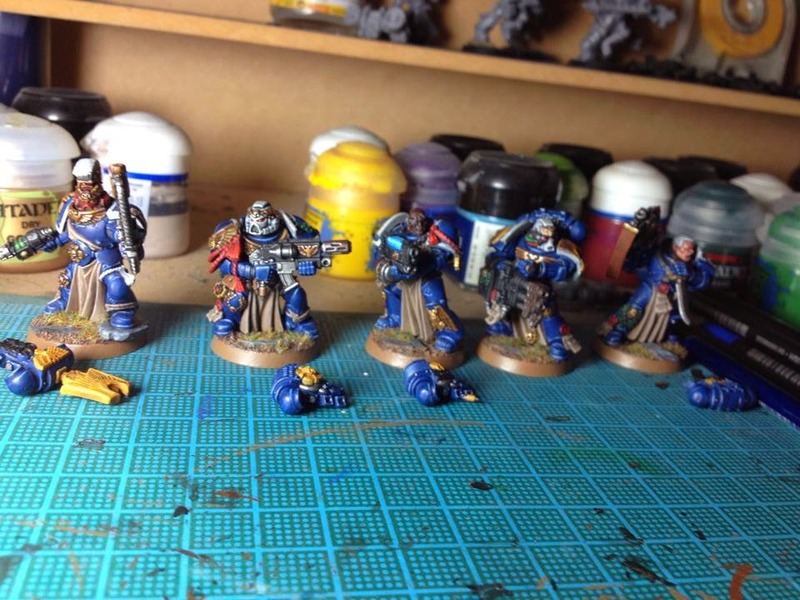 On top of that I got the blue done on the main bodies of 20 more Tactical Marines. Hoorah! Well this Saturday lots of pictures will be taken to share with all you lovely readers as I journey back for the third trip to Table Top Nation. Sorry this post was so short, more to come this month (hopefully). 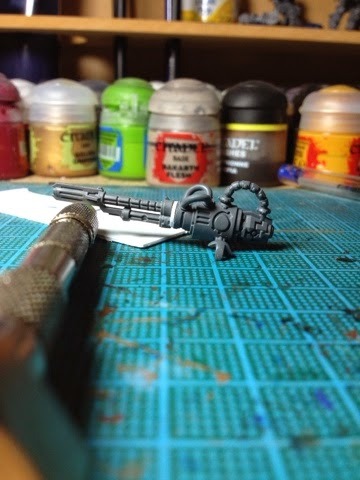 Above is my latest conversion idea for my Necrons, which I have called the "Ender Cannon, created from a Deathmarks Synaptic Disintegrator, Tomb Blade Particle Beamer and some plasticard. My idea is to model 5 of these on spider legs and use them as count as Harbingers of Destruction. The idea occurred to me when I saw a list with 5 of said Crypteks. 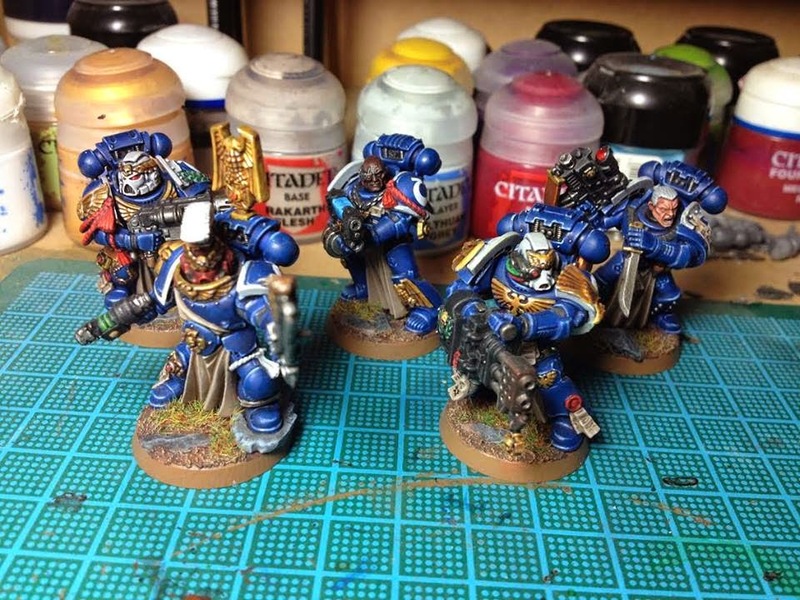 The idea of having a faux artillery unit really appealed to me, so much that I deviated from my beloved Ultramarines. I hope you enjoy it, and hope it inspires similar conversions!